It makes me uneasy to be underwhelmed by a book the rest of the planet rates very highly, but underwhelmed I was. I am neither a Greek scholar nor have I read Sappho previously, so maybe this was the wrong place to start. 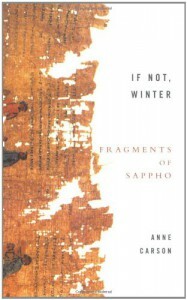 The ]s represent places in the original Sappho where the papyrus is destroyed or illegible. There are fuller pages than these, and many of the poems and fragments are supplemented by end notes, which are in part explanatory. I do like the frequent violets, and the "dripping (pain)" but give me Emily Dickinson any day.